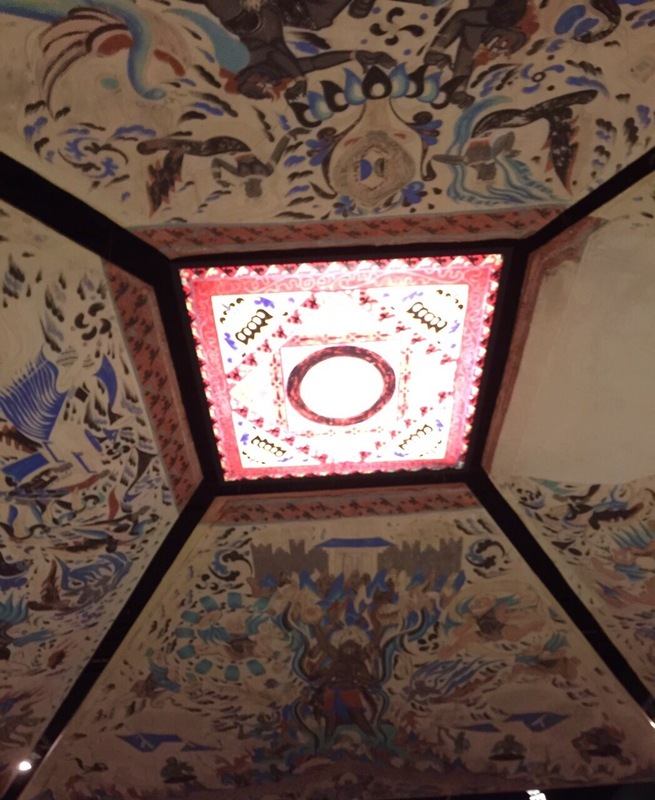 Dunhuang is an oasis town on the edge of the Gobi Desert in western China along the Great Silk Road. 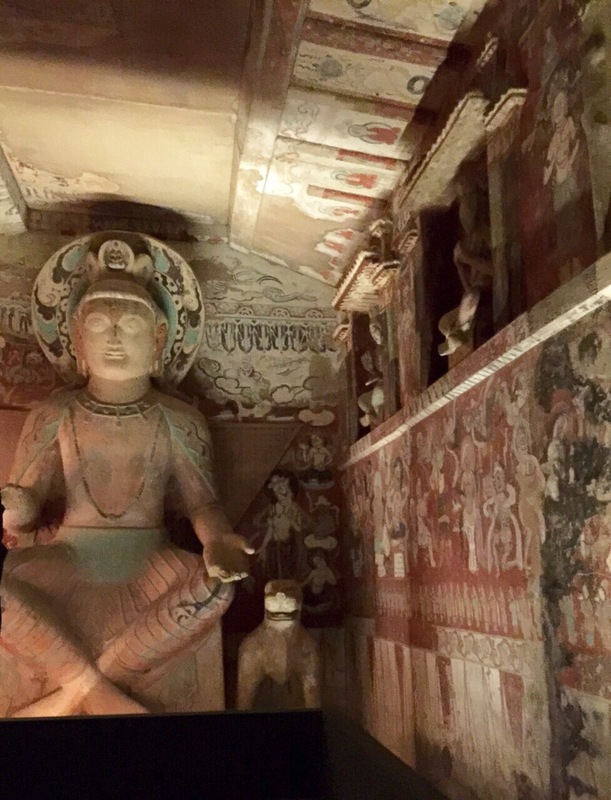 It was a famous center of Buddhist worship in the middle-ages, with pilgrims travelling from faraway to visit its cave shrines, comprising of hundreds of lavishly decorated caverns carved into a cliff on the city’s outskirts. 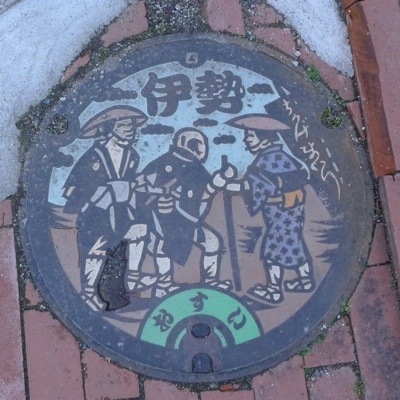 It was rediscovered by accident by a monk in the late last century. 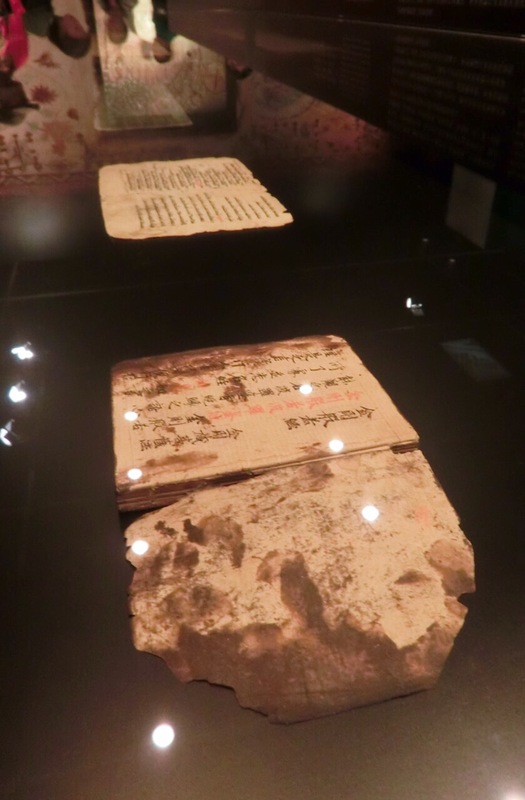 The Dunhuang Library is hailed as one of the great archaeological discoveries of the twentieth century, on par with Tutankhamun’s tomb and the Dead Sea Scrolls. 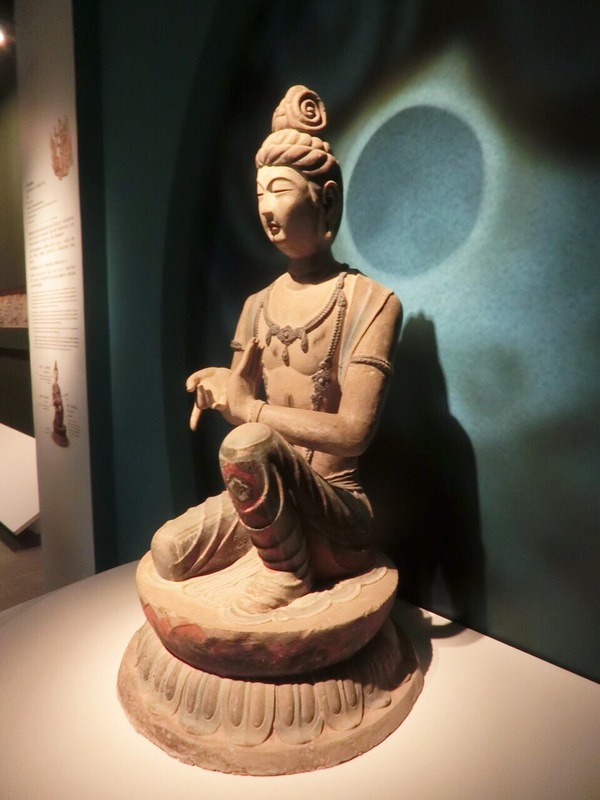 Here are some pictures of a fantastic exhibition put together by the Hong Kong Heritage Museum and no doubt Dunhuang is in my bucket list! However, I better hurry because it ecosystem is very fragile. 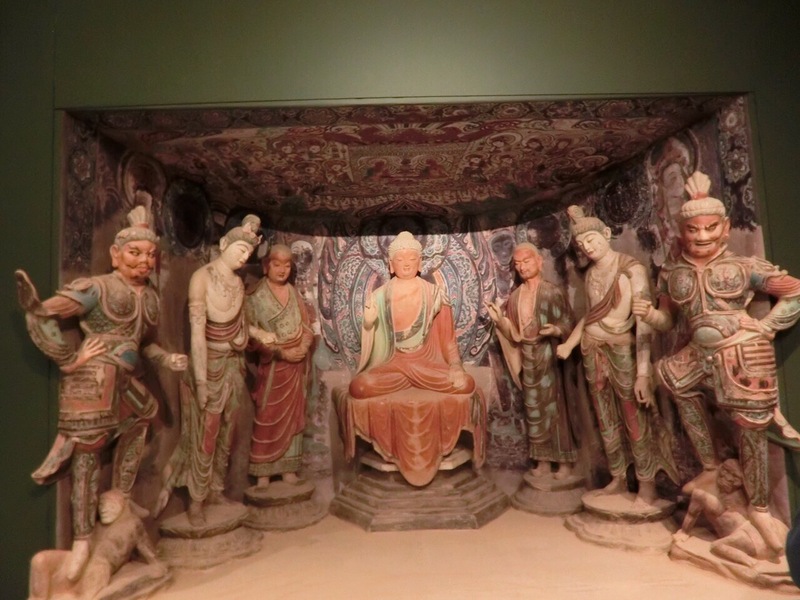 Buildup of humidity and carbon dioxide—from visitors’ breath—are flaking and discoloring the delicate pigment-on-plaster wall paintings, making it very vulnerable to mass tourism. 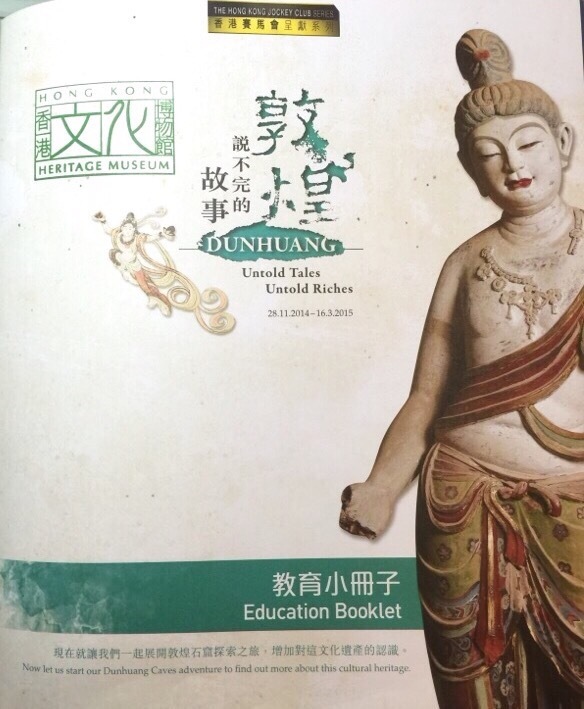 With Dunhuang entering the digital age, who knows, it might be closed to mass tourism in the future and the only way I get to see it will be via digital media! 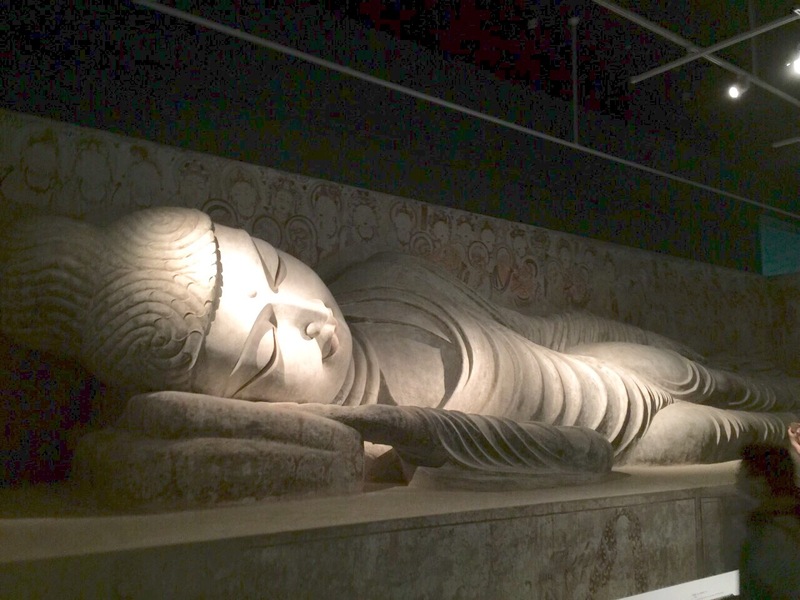 The 15.6 meter recumbent Buddha, serene in death with anguished disciples and mourners, is an iconic image of Mogaoku. 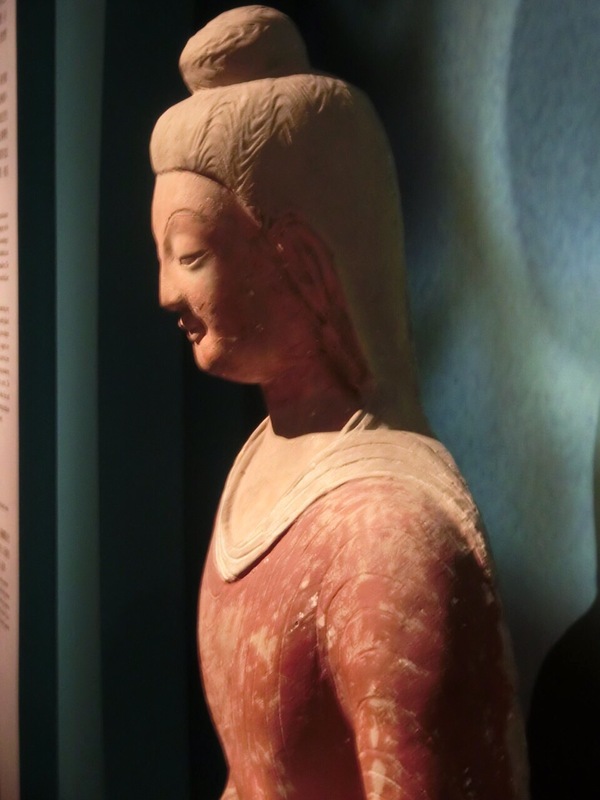 Artefacts from Silk Road times as well as replicas from the Mogao Caves. 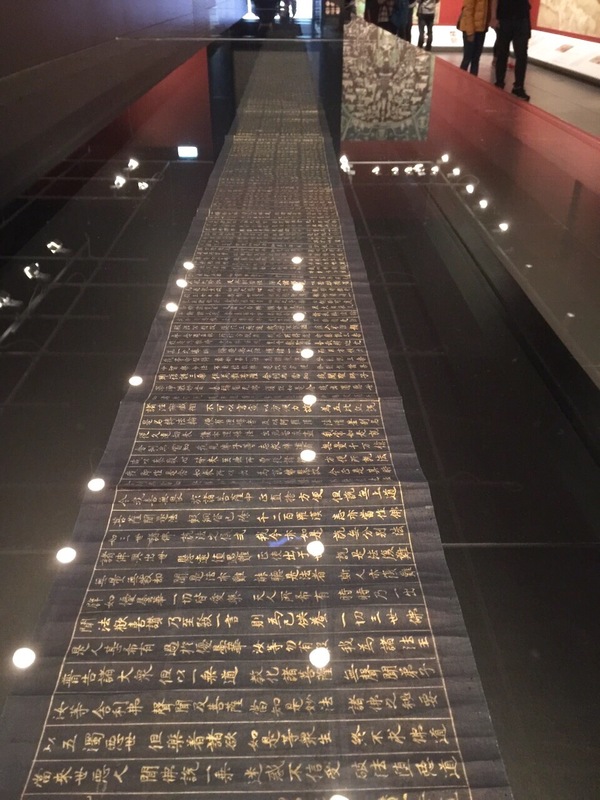 Scrolls and Manuscripts: The Diamond Sutra, a copy of a Chinese translation of one of the Buddha’s sermons, generally recognized as the oldest known example of a dated printed book. The International Dunhuang Project: The Silk Road Online is a massive international collaboration to make information and images of all manuscripts, paintings, textiles and artefacts from Dunhuang and archaeological sites of the Eastern Silk Road freely available on the Internet and to encourage their use through educational and research programmes. 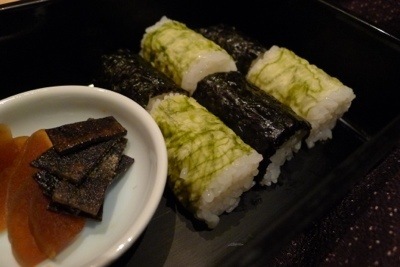 For the first night in Tokyo, I did not bother to make any dinner reservations since I did not want to tire us out by dashing off to find the restaurant as soon as we arrived. 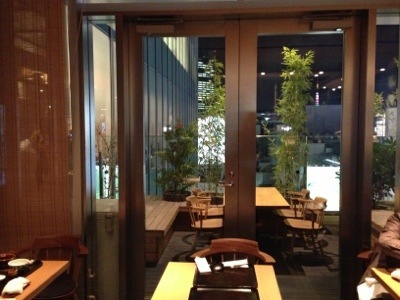 It turned out to be a mistake – all the restaurants (the ones that we are interested in) were FULL! After wandering around Ginza, we were still undecided which restaurants to eat in and whether there is an English menu available. 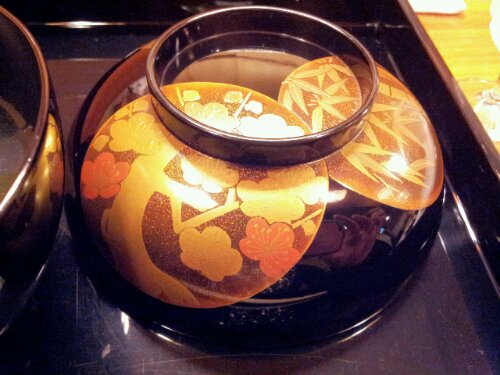 A quick think on our feet, led us to the Ginza Mitsukoshi Department Store. 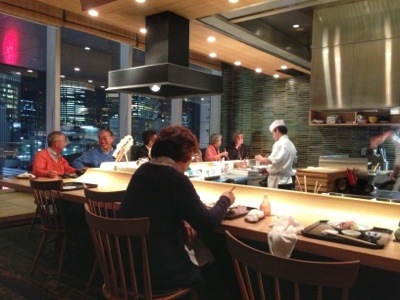 There are 2 levels of restaurants serving International cuisines -Japanese, Japanese-European,European and Chinese (on Levels 11 and 12) inside the department store . 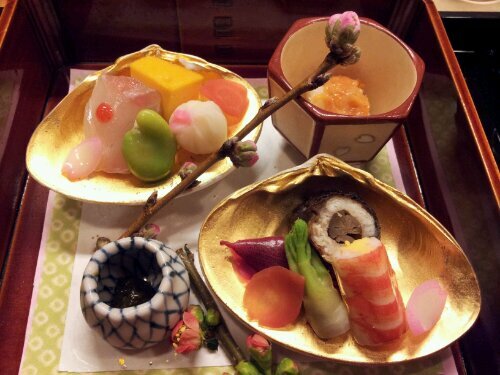 We finally decided on a Japanese restaurant on Level 12 serving called 石桶花. We were served by 2 very courteous and efficient waitresses. 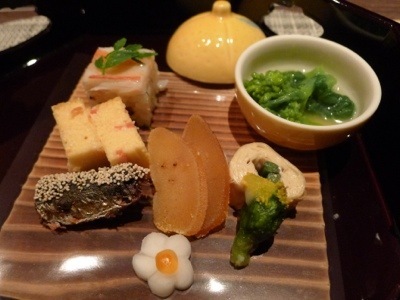 We were given an English menu with 3 courses to choose from – Banquet Cuisine Meal ¥4,800; Sumire Kaiseki Cuisine at ¥5,500 or Shakunage Kaiseki ¥8400. 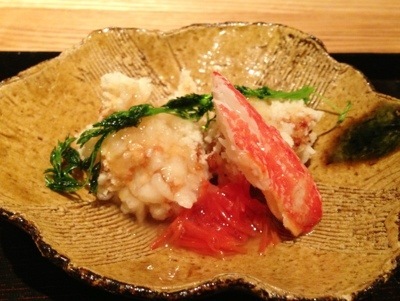 We settled on top-end Shakunage Kaiseki. We were very appreciative that the waitresses made a conscious effort to communicate with us and also to explain in English what is being served at each course. 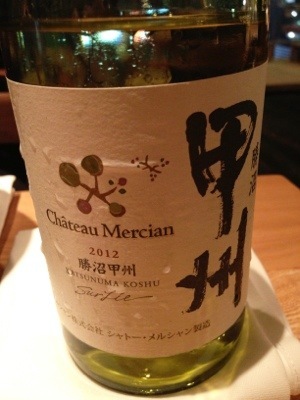 To drink: We ordered a bottle of Japanese white from Chateau Mercian Katsumnuma Koshu ¥4,300 (the only Japanese white available on the menu). Clean and crisp on the palate, it has a pleasant astringent taste, and with an aromatic grapefruit and green apple finish and another note that I could not put my finger on – it turned out to be banana when I read the tasting notes (here). 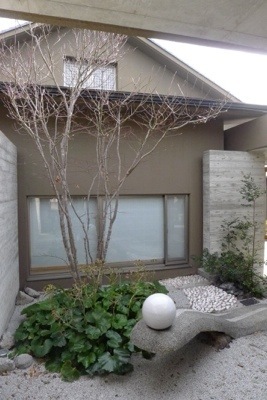 The pleasant scent of the white-flowers reminded me of sake too. A very enjoyable white from Suntory Brewery! KAMPAI!! 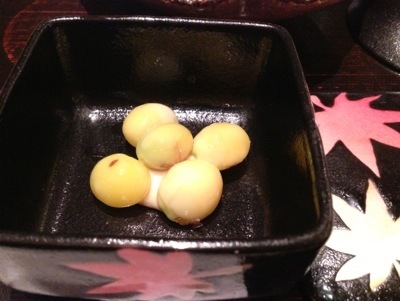 Appetiser #1 was 5 Gingko Nuts on a bed of sweet miso. Gingko nuts has a gummy texture, their rich, nutty flavour has a quick bitterness to it. (An important note is that children should not eat more than five ginkgo nuts per day, and adults should not eat more than eight per day. Going over these limits can result in ginkgo poisoning!! 😱). Appetiser #2 consisted of crab meat, a deep-fried yam coated with sticky rice, a deep-fried sweet potato coated with sticky rice and some jellied pickles. I enjoyed the sticky yet crunchy-puffy-fried-rice a lot which provided a different layer of texture to both the yam and potato. 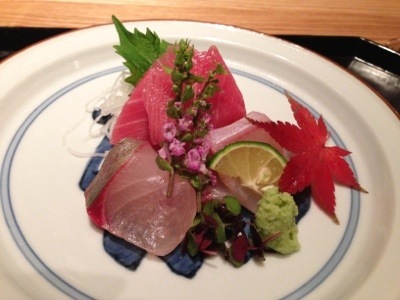 The Sashimi was very fresh – although not the top quality, but still standing head-and-shoulders above the sashimi served in top-hatted Australian restaurants. 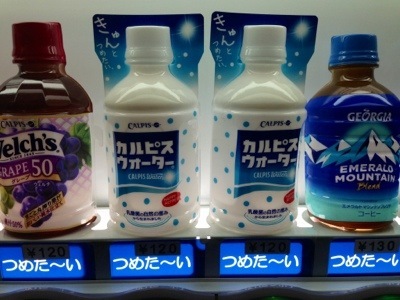 Understandably, the Japanese keep all the premium stuffs for their own local consumptions whereas other countries (e.g. Australia and especially China tend to export their top produces to overseas markets.) Here, we were served with yieldingly firm Yellow-tail, Kingfish and a very fatty Tuna that literally melts away in our mouths. 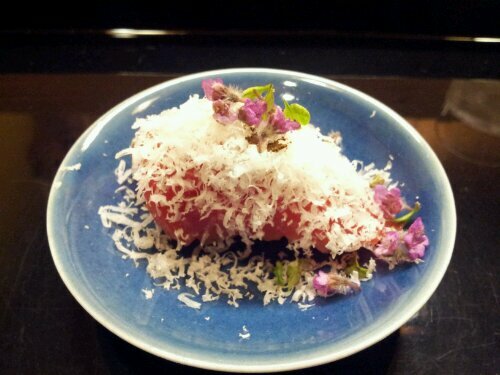 The dish was beautifully presented with edible flowers, shiso and shredded radishes. 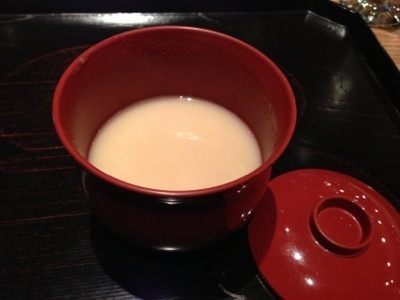 Since this is Winter, we were served White miso soup with Mochi. 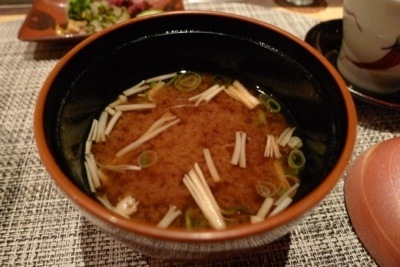 The soup leans towards to the sweet side. 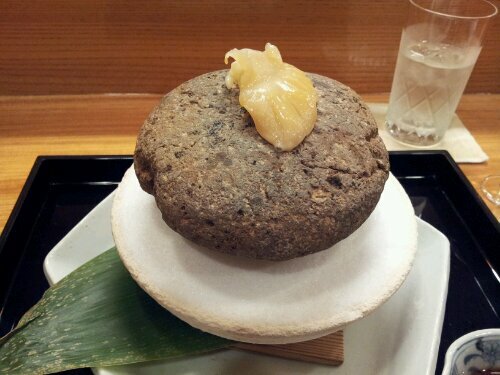 I thoroughly enjoyed the chewy and glutinous texture of the mochi that has been slightly chargrilled before it went into the soup. 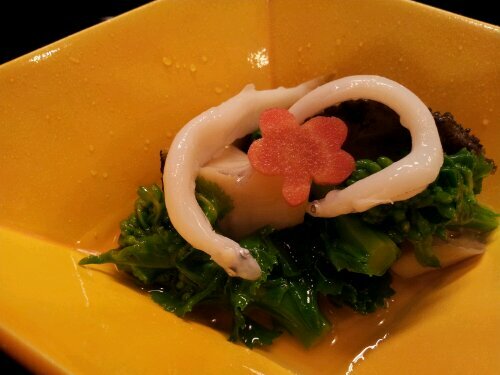 Delicacies of the Season are winter root vegetables – mushrooms, pumpkin, fresh tiny shrimps, burdock and yam. 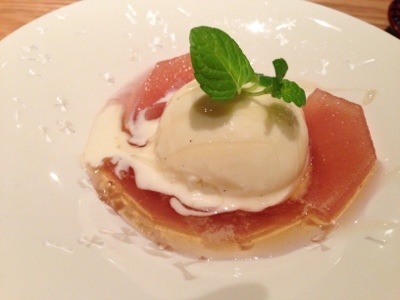 Each very delicious and has natural sweetness to them. Next to follow is the Soup. 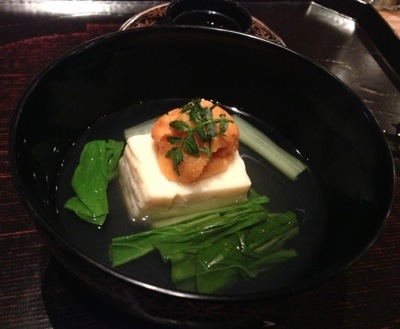 The star of this course is definitely the Sea-urchin on Tofu. 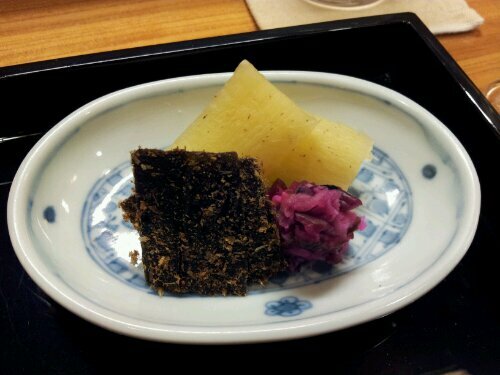 Ilove the sweet briny taste of the sea-urchin very much, the tofu has an unusual texture that I was not accustomed to due to its stickiness, perhaps sticky rice was added to its list of ingredients. 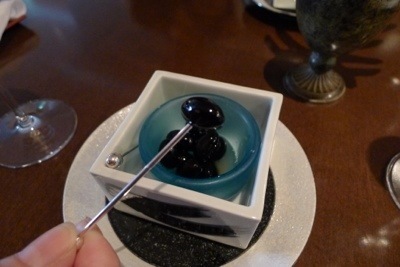 The salty soup was very gelatine-y, and worked well to cleanse the palate of the briny sea-urchin. 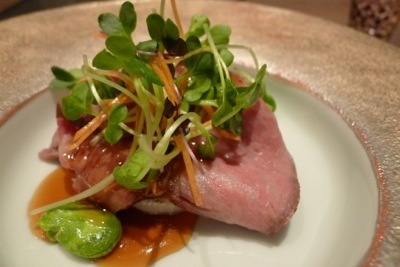 The Grilled Japanese Beef course literally melts in my mouth! 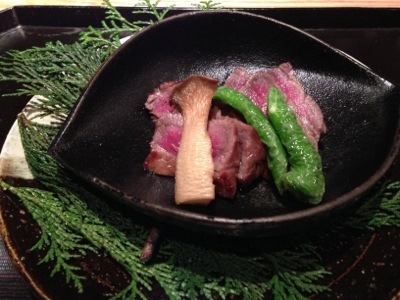 This is Kagoshima beef was simply seared and served with Japanese green peppers (not hot) and enoki mushroom. 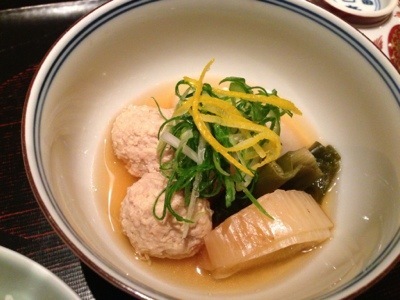 For the Boiled Dish, we were served 2 minced pork balls as light and fluffy as soufflé, they were joined by Japanese leeks, onions, fungus and shreds of yuzu peels for a citrusy kick. 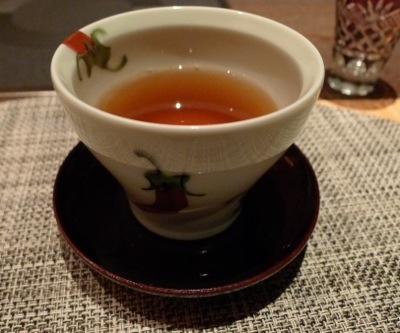 We were also given a hot black tea (Ocha). 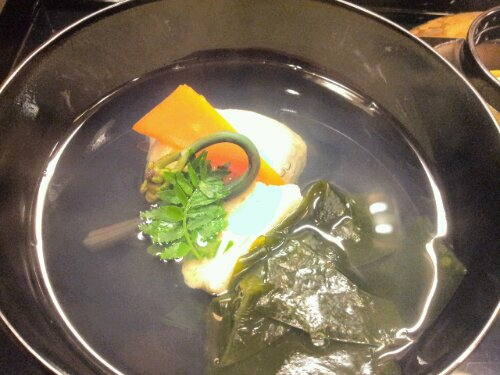 The boiled dish forms part of the last course of our kaiseki dinner, with pickles, rice and a side of salmon roe (ikura). 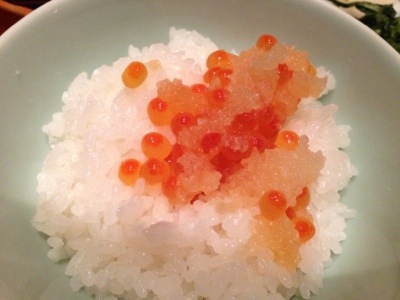 We were asked to eat the rice with the ikura. 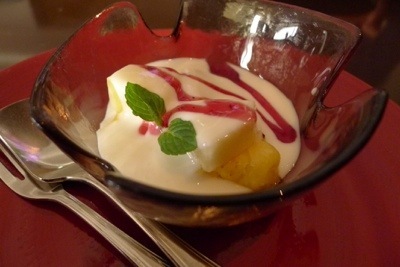 The food served at the restaurant all tend to be on the sweeter side, due to sugar content of miring sauces used. During dinner, a Japanese business man had a heart attack, but still we had seamless service, everybody remained calm and helped the man to wait for ambulance. 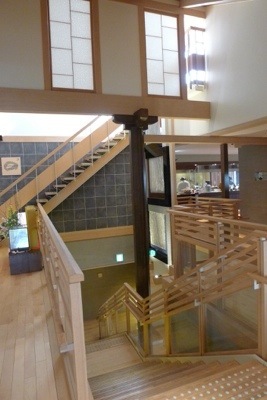 Check out the interior of the restaurant. 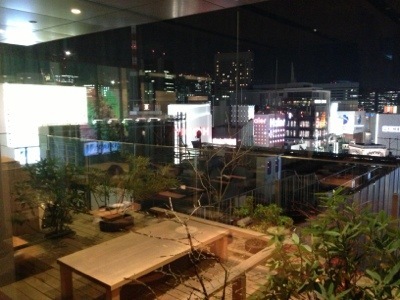 Outdoor seating in Summer – a fantastic place to watch Ginza night view too! Amidst the cacophony of strumming string instruments and whistling pipes, 5 girls in Shinto robes are staging a prayer-dance in slow, circular movements, paying respects to all the 4 directions while holding the fans and bells in their hands (torimono). This is Miko Kagura, one of the oldest type of kagura danced by women in Shinto shrines. Originally, miko kagura was a shamanic trance dance, performed by the miko who were shamanesses but it later evolved into a prayer-dance led by the priestesses in the service of the Shinto Shrines. 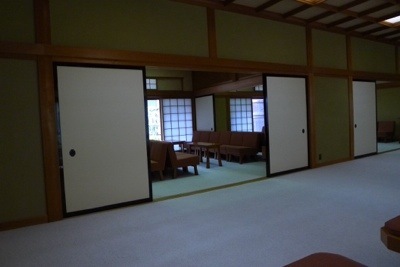 I am kneeling with my back straight, sitting seiza-style at my Bro’s Shinto Blessing ceremony in Kaguraden (Hall of Sacred Music and Dance) at Ise Grand Shrine. Finally, after what seemed an eternity – 40 minutes – the priest read out his last verse in humming sing-song chants. He invited everyone to join in by bowing twice, then clapping our hands twice and following our final bow – the drum is beaten. We are now allowed to step out of our seiza. To complete the ceremony, my Bro and the other worshippers receiving blessings were invited to receive a sip of sacred sake and a piece of blessed wood to take home. For me, I am only too happy to find my feet again! 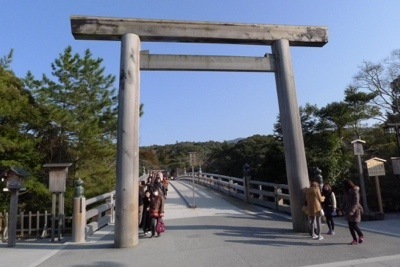 Ise Jingu or Ise Grand Shrine is the holiest and most important shrine in Japan with over two thousand years history. 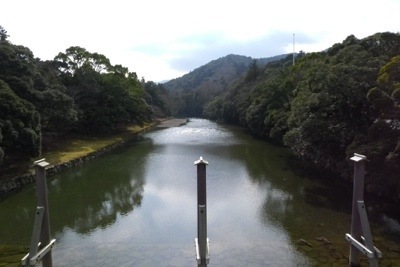 This is where the Japanese prime minister comes to, to make his new year’s prayer every year. 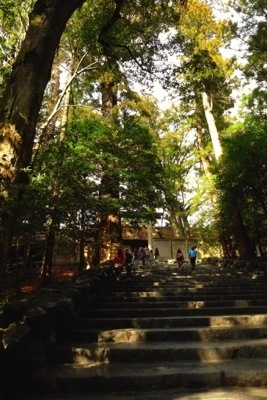 There are two shrines to the Ise Jingu Complex: Naiku (inner shrine) which is dedicated to the sun goddess called Amaterasu – the mythological ancestor of Japanese Emperor – and Geku (outer shrine) which enshrines the deity of food. 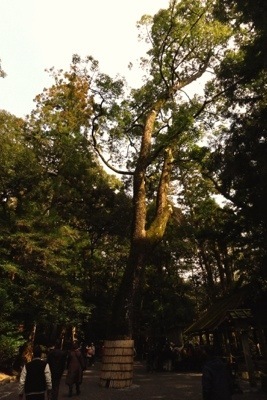 Each site has the central building for worship which is not open to public and a number of sub buildings in a forest. 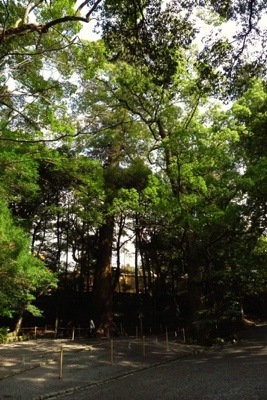 Most people visit Geku first, then Naiku, but if you don’t have time, my advise is to visit the larger grounds at Naiku. 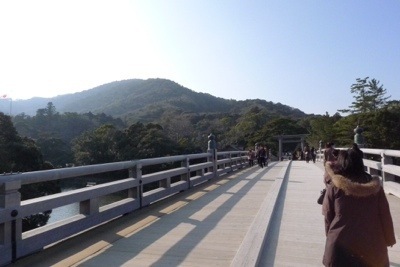 This year, 2013 marks a significant year of renewal for Ise, known as ‘Sengu‘ – whereby the shrine buildings at Naiku and Geku, as well as the Uji Bridge, are rebuilt every 20 years in accordance with the Shinto belief of the death and renewal of nature and the impermanence of all things – and also a practical way of passing building techniques from one generation to the next. Parked car. Walked into a busy pedestrian-only street and had lunch at one of the many noodles shops around. 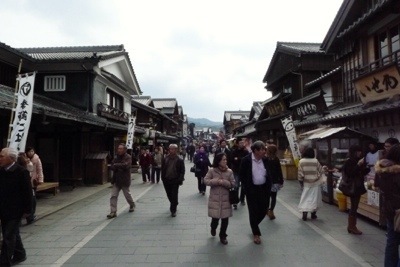 Oharai-machi: A pedestrian-only street replicating the Meiji-era merchant quarters, very touristy but well-maintained. 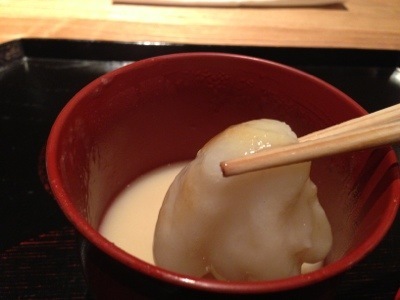 Stopped by the famous dessert shop for Akafuku mochi (here). 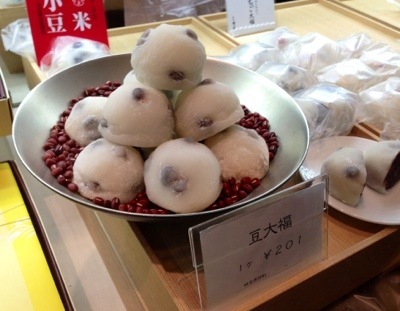 This is another variation of mochi with red bean paste with 3-finger indentations encasing a glutinous rice center. 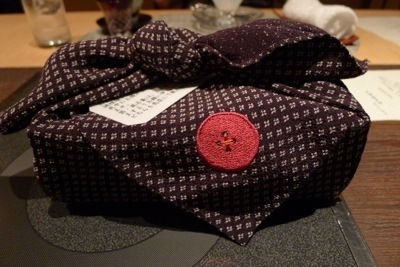 The mochi is very delicious and I do suggest buying a couple of boxes as souvenirs, although you can also buy them at convenience stores and service stations around the area. 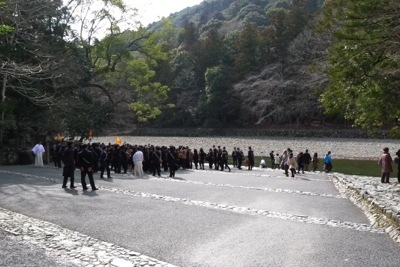 A fair walk later, we came to Uji Bridge -the entrance to Naiku – we gave a customary bow then walked onto the bridge across the Isuzu River. In Japan, the mysterious forces of nature, called ke, were believed to permeate palpable matter and formless space (collectively called mono in Japanese) to create mononoke. 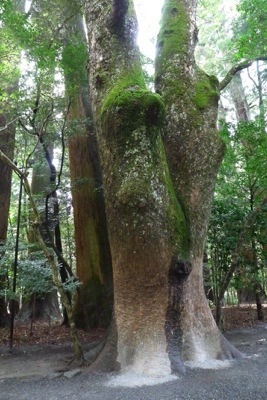 Mononoke was seen to coalesce in trees and stones. 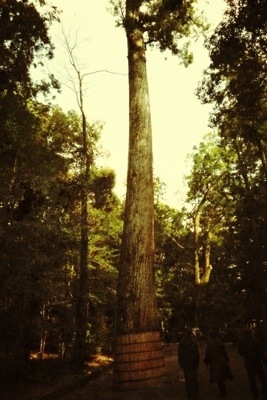 Thus, the beautiful trees to look at and lots of walking on gravelly stones! 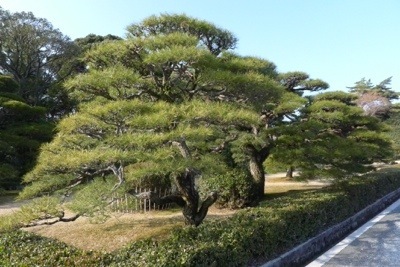 Ise Jingu is built amid a dense forest of giant cryptomeria trees which are sacred, covering an area of 5,500 hectares (13,600 acres). 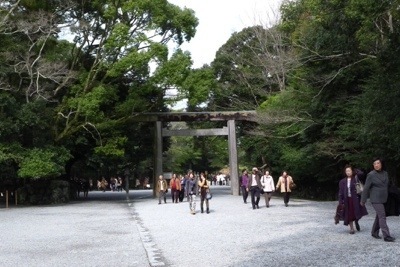 Abut 90 hectares of the area around the shrines are untouched since they were founded 16 centuries ago. 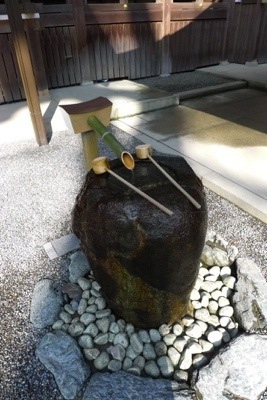 The rest has been used to provide construction materials for shrine construction. 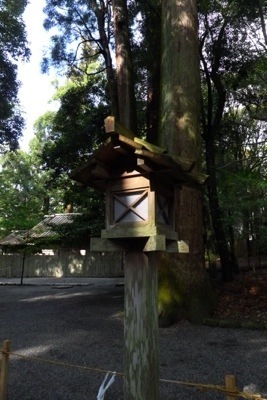 Naiku Shrine is enclosed in sacred enclosures. 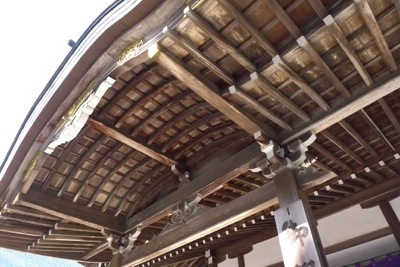 The strong pure lines in the structure is said to hold mystical powers. 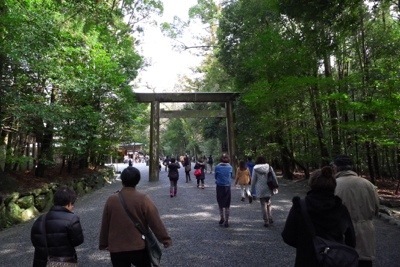 After visiting the shrine, the worshipper has walk the path to the west of the sanctuary, to see the rice storehouse, treasury and also to get a view of the Naiku Shrine, however, we retraced our footsteps instead and found oursleves to be walking against the crowds. 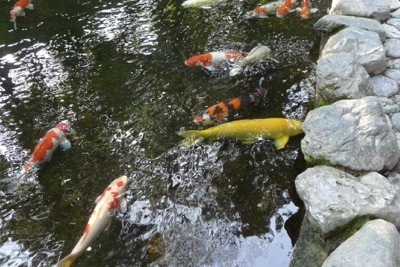 Since it is regarded bad-luck to walk against the flow, we decided to return to our original path. 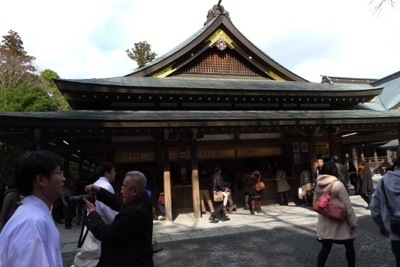 So here’s a file picture from the internet to show you what the Naiku Shrine looks like, although obscured by the high wall. 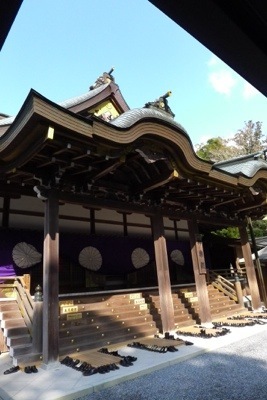 Only members from the Imperial Family and head priests are allowed into the Inner Sanctum where Amaterasu’s sacred mirror is said to be held held, wrapped in layers of clothes, no one had laid eyes on it for thousands of years. 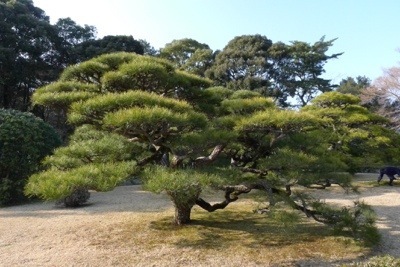 The building material from roof to floors for both structures and finishing comes entirely from Japanese white cypress, Hinoki. The wood is unvarnished and unpainted, displaying the wild beauty of the cypress’s natural texture. No nails are used, only dowels and interlocking joints. 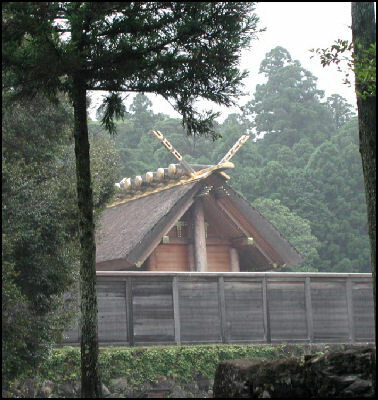 The roof is thatched with miscanthus grass.There are crossbeams at either end of the roof and large rounded logs on the ridge of the roof. 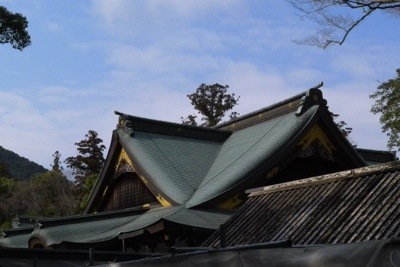 Protruding from the upper part of the gable at either end of the building are metal-tipped poles to add structural symmetry. 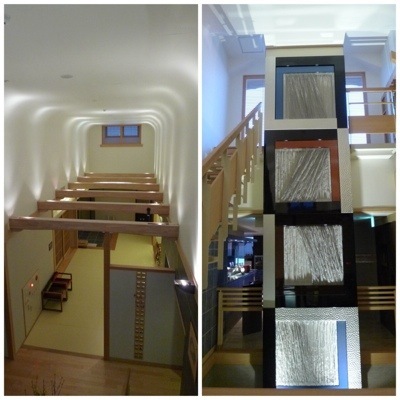 The main building of the Naiku is designed in a special form of architectural style, called shimmei-zukuri. 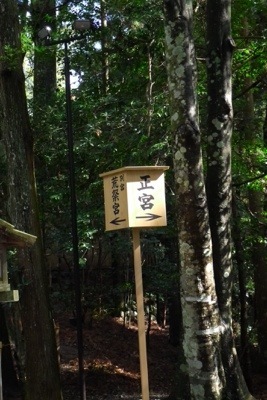 This style is prohibited for other shrines. 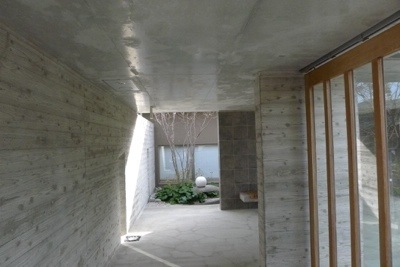 It’s simple rectangular design is said to derive from the granaries and treasure storehouses of prehistoric Japan. 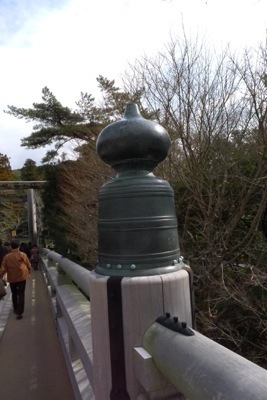 In the middle of Uji Bridge and the Naiku Shrine is the Kaguraden. 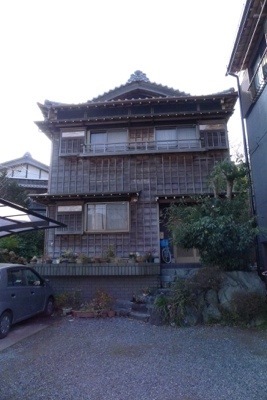 There is a building next to it where the worshippers can buy omamori or Japanese amulets (charms, talismans) for luck or protection against adversity which costs about USD5. 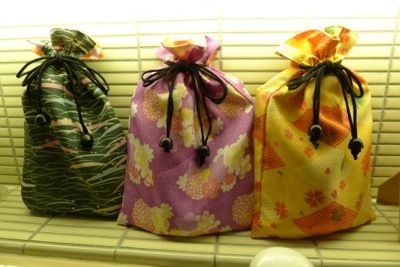 The luck lasts for one year but after that the charm needs to be returned to a Shinto shrine for disposal. According to legend, there’s a God inside so they should never be opened or disposed of improperly. 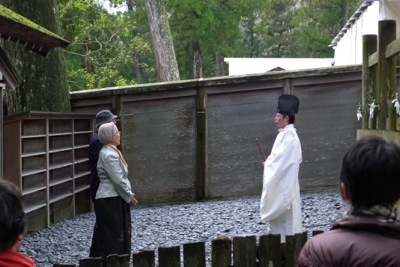 The worshipper can also request a blessing ceremony to offer their thanks and wishes to Amaterasu Omikami. This is a special prayer to the kami accompanied by ceremonial music and dance which has been performed from ancient times. Residential houses in the neighbourhood with perfectly landscaped gardens. 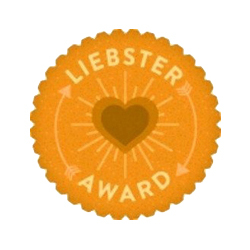 Check out what I saw on the ground! And I believe this to be on my bucket-list! Answer to guess here. 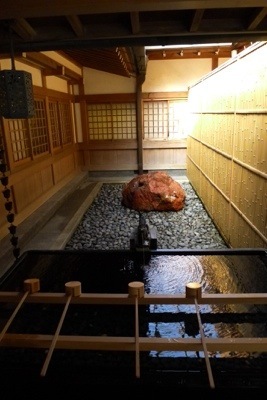 To truly enjoy traditional Japanese hospitality, one should at least stay at a ryokan – like what I did for my little R&R after Tokyo Marathon 2013! 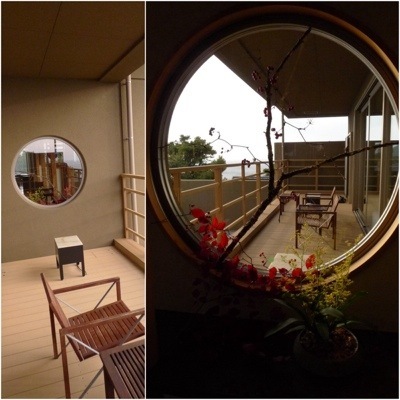 Never heard of a ‘ryokan’? Easy-peasy, let me explain…. 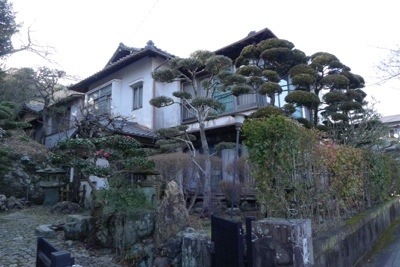 Ryokans are traditional Japanese inns which became popular in the 17th century (Edo Period) to accommodate travelling merchants and feudal lords along the Japanese highways (gokaidou). In feudal Japan, vast landholdings were controlled by the Daimyo, ‘territorial lords’. In order to stop them from becoming too powerful and rebellious, the Shogun, ‘generalissimo’, issued a directive that all Daimyos have to travel to Edo (current day Tokyo) every other year (sankin-koutai) to spend a year in Edo where their wives and children were forced to remain as hostages. 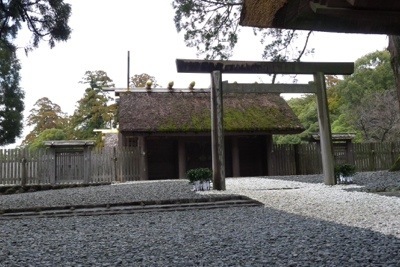 Since the Daimyos travel in an entourage of hundreds of people, they needed frequent stops along the road to rest and eat, and thus the traditional inns were born to serve these needs. 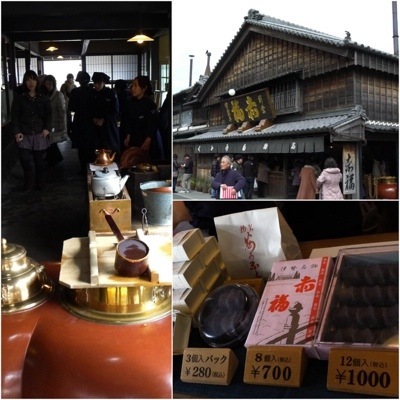 Today, the ryokans continue as the cornerstone of Japanese culture offering retreats to visitors to immerse in traditional customs, cuisines and architecture. 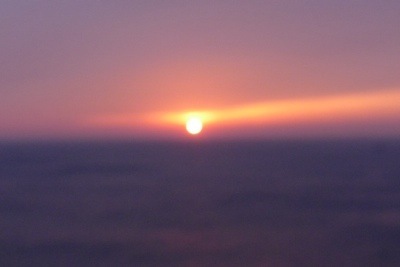 Ditto-ed and onward to my stay at Oyado The Earth!! 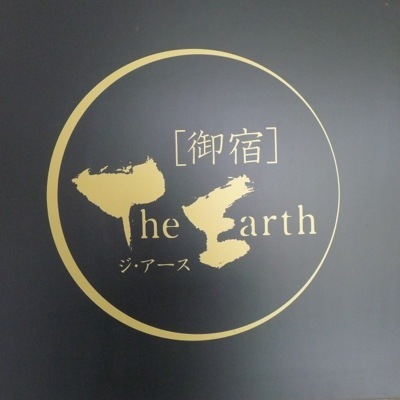 Oyado The Earth (OTE) is a 16-suite inn in the City of Toba located at the northeastern end of the Shima-hanto Peninsula in Mie Perfecture. 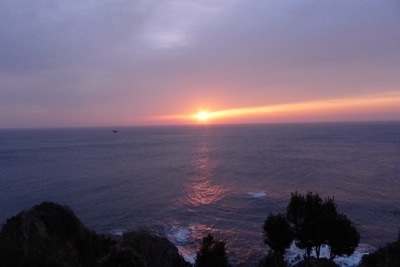 Bordering the Ise-Shima National Park and facing Ise Bay of the Pacific Ocean, Toba is also a beautiful place for boating and hiking. 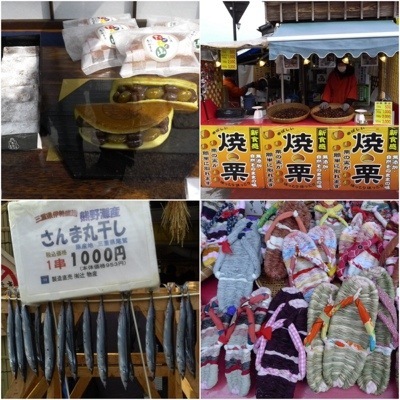 The area is famous for seafood especially oysters and cultured pearls. Does Mikimoto ring a bell, Ladies? I am sure that you are all too familiar with the name synonymous with the perfectly round pearls – and this is where it all started – Toba! 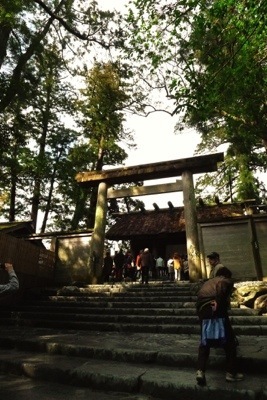 Nevertheless, the main reason I travelled down to Mie Perfecture was to visit Ise Grand Shrine – the most sacred shrine in Shinto religion. I was also lucky to have Taka, my friend whom I met in Hong Kong ages ago to volunteer as driver for Mom, Bro and I. 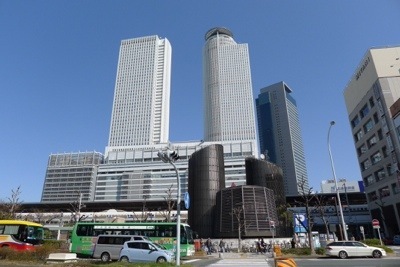 (FYI: If you are not as lucky as us, OTE is 2 hours and 45 minutes by car from Nagoya, or a 1 hour 40 minutes by train from Nagoya station to Toba Station and a further 35 minutes ride by car from the station). 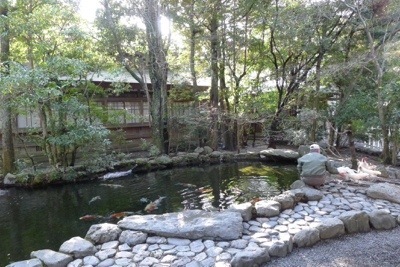 Booking Oyado The Earth (apparently ‘oyado‘ is another word for traditional-style Japanese inn) meant venturing into unfamiliar territory for me and proved an interesting exercise since I could not find much online reviews when I started booking back in December 2012. 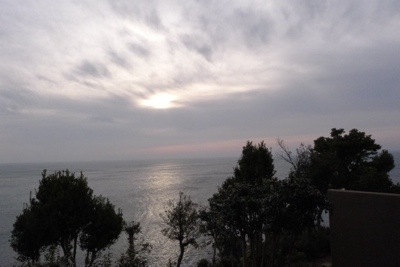 And what a wonderful surprise to find out how wonderful The Earth was! 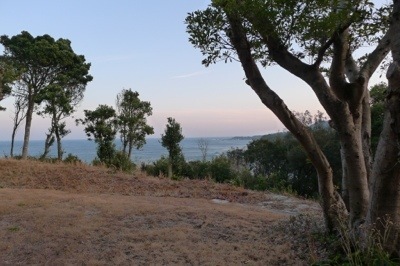 OTE is set in a near total immersion in a relatively pristine natural environment surrounded by forests and Toba Bay. 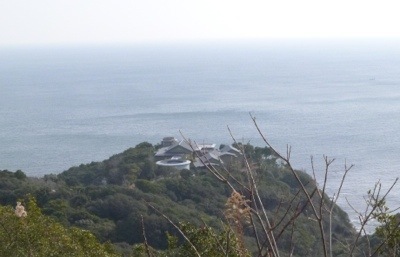 From the observatory deck in The Earth, one can easily see the numerous islands in the middle distance. Our trip to OTE took us down the windy narrow and rocky road to the edge of a cliff. We were very suprised to find the hotel attendant already waiting for us at the gate to direct us to our carpark. The passageway to OTE is quite James Bond-ish – cue in the automatic steel sliding-doors and zig-zag corridors with pockets of landscaping. 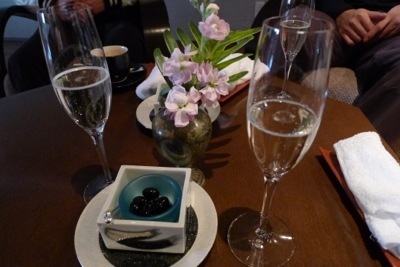 While waiting for the key to our room, we were seated in the lounge and treated to a welcome drink of sparkling wine and Japanese sweets. 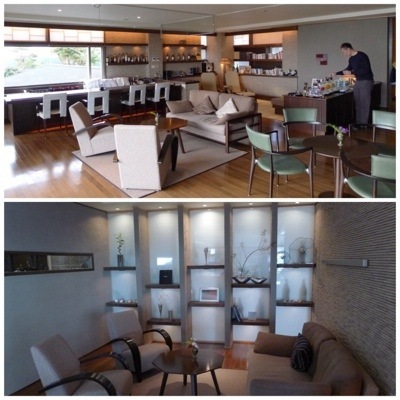 OTE’s common spaces includes gender segregated 24-hour hot-springs bath or onsen (on the ground floor where the rooms are), a cosy library and an adjoining lounge furnished with plush sofas. 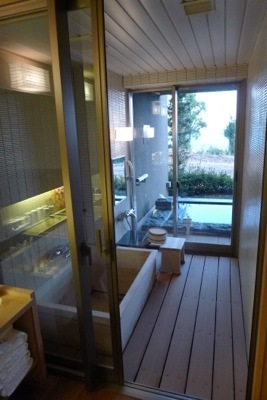 While each suite in OTE has a private open-air spring-fed onsen attached, ours went one step further with our own private entertaining room and a guest toilet. Our Premium Suite is very spacious, we also have a separate sitting area for Bro to close off for his privacy. 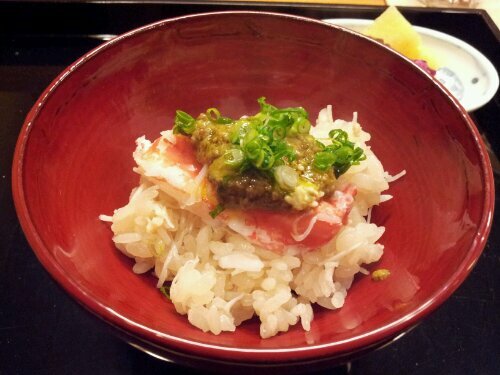 He slept on a make-shift futon which was laid out on the heated tatami mat when we were having dinner. 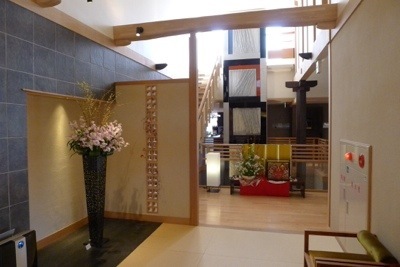 I have to point out that service in Japanese hotels are truly all-inclusive whereby pajamas and toiletries are provided – the guest simply has to turn up! 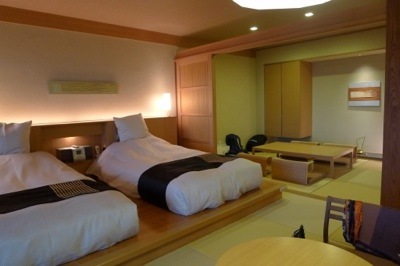 Our room. 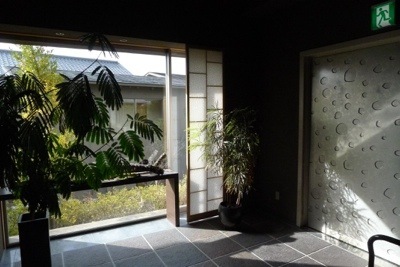 Note the sliding screen door which can be closed off and the cupboard where extra futons and yutakas are kept. 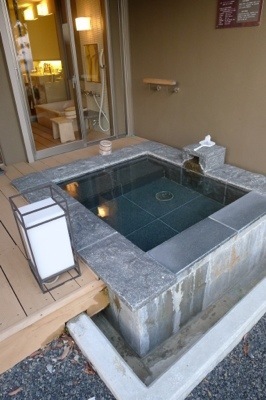 We had a small outdoor onsen where Mom, Bro and I went to soak our feet after dinner. Even though we were sitting in the freezing cold, the hot water warmed us up and I must say the stiffness in my calves and feet literally melted away in the hot water from the springs! 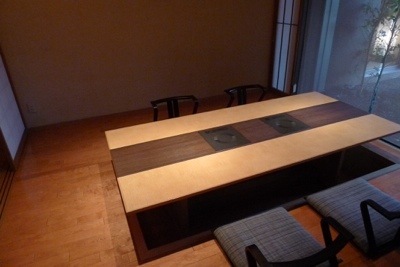 Our private dining room with heated kotatsu seating which is adjoined to our room with a small kitchen. Our packaged stay came with elaborate set meals for both dinner and breakfast, served at a time set by us. (‘Confession!’: I had exchanged some emails with the Eri, the GM of the hotel, regarding dietary requirements and meal times, so even though the attendants did not speak much English, everything went smoothly without a hitch!) 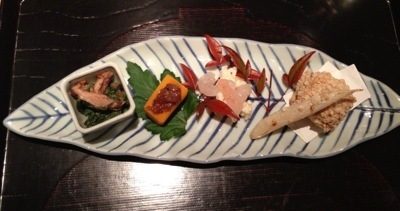 We had the traditional multi-course kaiseki dinner, drawing on freshest produce from the land and sea in the area. 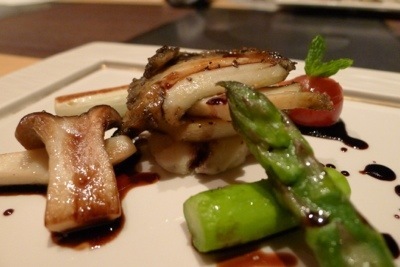 4th Course: Asparagus and mushrooms specially prepared at our kitchen by our own private chef! 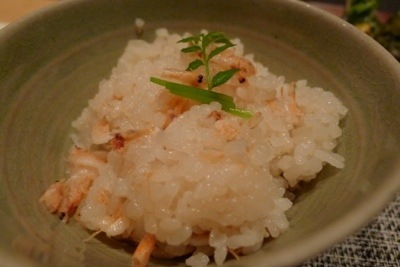 6th Course: Seafood – remember to request Ebi lobster, the speciality of Mie Perfecture! 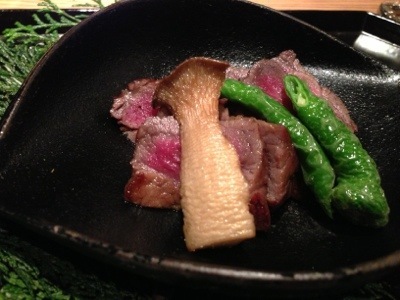 7th Course: Kagoshima beef accompanied by the biggest broad pea ever! 9th Course: Preserved vegies and a cockle dressed in mustard. Yum! Last, but not least, OTE left no details out, by ensuring that we have our midnight snack of rice and roe on standby in case we wake up in the middle of the night hungry! We woke up early the next day to catch day-break. 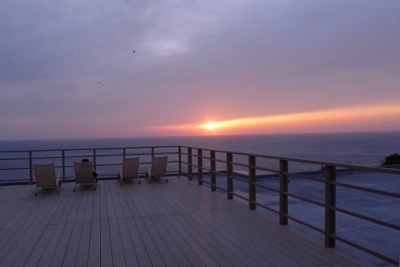 Watching the sun-rise was truly a majestic experience and made even more special by catching the sun rising over the the Pacific Ocean. We had our breakfast at the restaurant at 7:30am as arranged. Here is our very attentive server. 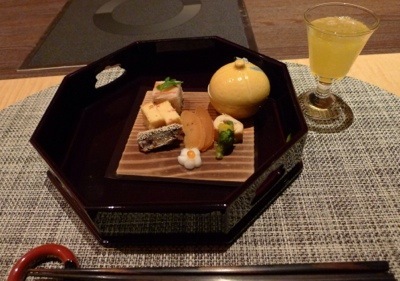 Our breakfast of assorted small dishes was literally fit for a Daimyo! Hang on! That’s not all for breakfast! 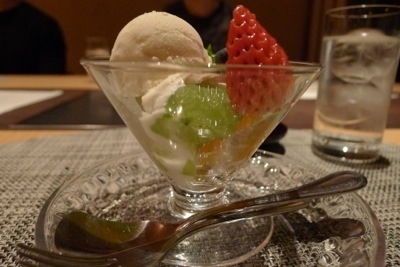 We were invited out to the Lounge for fruits and yoghurt while waiting for Taka to pick us up! More Oishi! 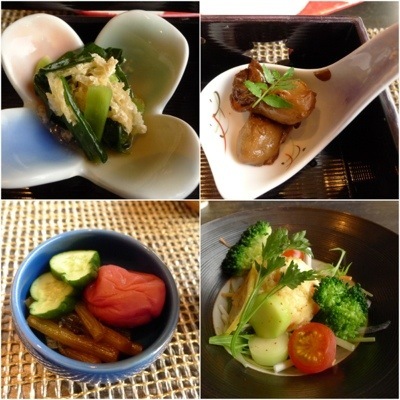 It was truly a fantastic experience staying at OTE – delicious food, attentive service and beautiful surroundings. 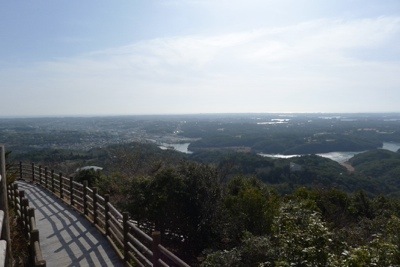 The only regret is that we only stayed overnight, if we revisit Toba in the future, we will stay for an extra few days to take in attractions of the area such as Meoto Iwa, Toba Aquarium, Mikimoto Museum and Pearl Island – maybe even go hiking in the Shima National Park. We also had a warm send-off from the manager. As Taka drove out of the oyado, we noticed in our rear-view mirror that the manager maintained his deep-bow position until we lost sight of the oyado! Wow! 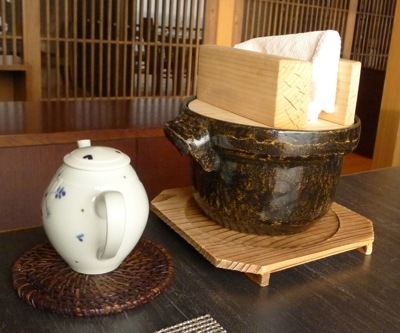 Now, THAT was a real traditional Japanese hospitality! Before we headed back to Nagoya train station, we detoured to visit Ago Bay which came highly recommended in the Michelin Green Guide. The winding road to Ago Bay is a bit like the Great Ocean Road in Victoria, Australia – trees and shrubs on one side of the road and scenic water views on the other. 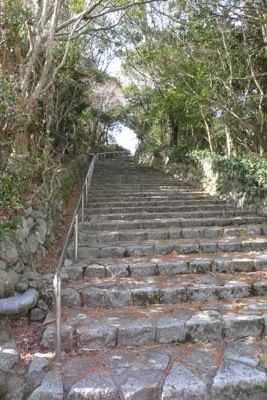 Once we arrived at Ago Bay, we had to climb some steep steps to reach Yokoyama Observatory Deck. 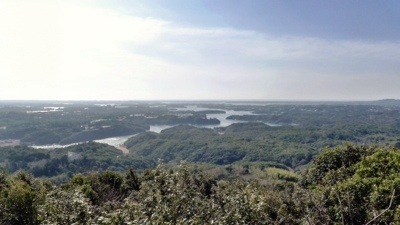 There, at the height of 203m, one can take in the spectacular panorama overlooking the peninsula to see with our own eyes the famous saw-toothed coastline that has more than 60 small islets. 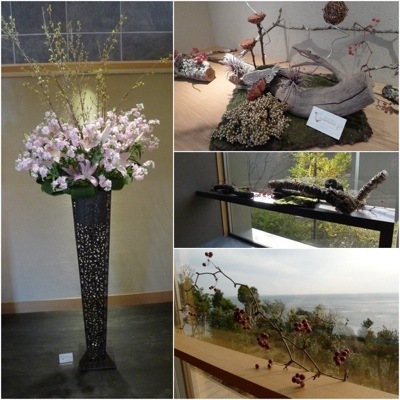 It is said that every season has its natural beauty, such as cherry blossoms and red maple leaves. After 30 minutes, it’s time to head back to Nagoya train station to drop off our rental and onward journey to Kanazawa! 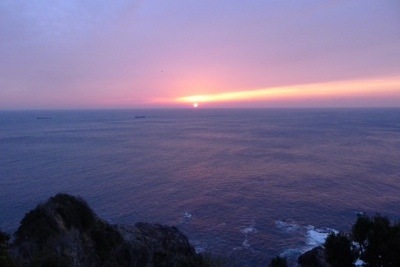 Additional info: I booked Oyado The Earth through JAPANiCAN.com (here) and hired our car from Japan-experience. com (here). The ancient capital of Japan, Nara is 45mins away from Kyoto (there is a direct trolley running hourly, but don’t hop on the train bound for the other direction like I did!). 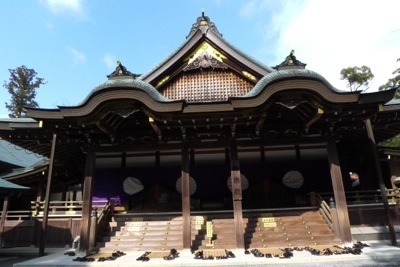 Compared to Tokyo and Kyoto, Nara is a tranquil town, boasting temples and shrines. 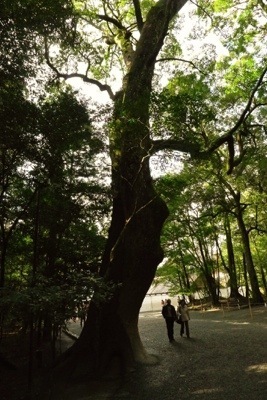 Most significantly Nara is a World UNESCO Heritage site and my prime reason to visit Nara is to visit the temples there. 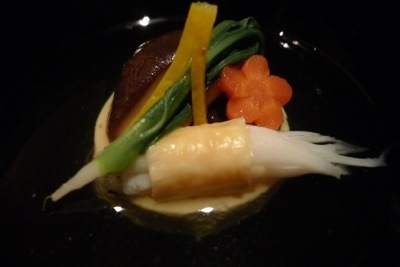 However, my quest to eat at Michelin-rated restaurants continued, and I was thrilled to find Wa Yamamura, a local Nara restaurant that has been awarded a 3 stars status by the Michelin Guide in Andy Hayler’s web of international restaurant reviews (here). 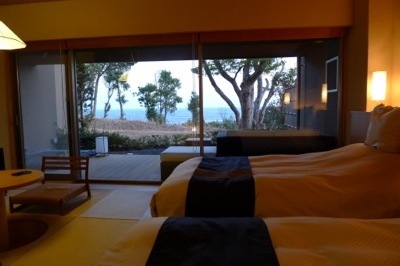 Since Wa Yamamura’s webpage is in Japanese, I asked my hotel concierge at Hotel Nikko Nara to book for me. 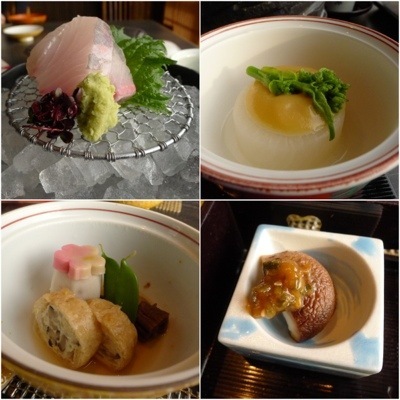 The Kaga cuisine of Kanazawa is a distinct regional cuisine known as kaiseki ryori (a traditional Japanese multi-course meal) which is famed for fresh seafood caught off the Sea of Japan, rice and vegetables growned in the Kaga Plain and superior sake made from the quality water from the Hakusan Mountains. 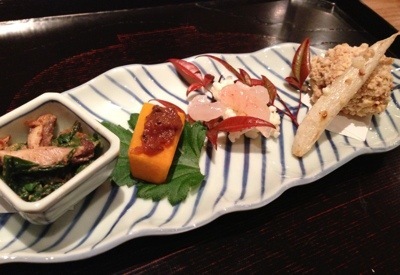 It was a lucky fluke that Zeniya turned up in my search for fine dining in in Kanazawa. 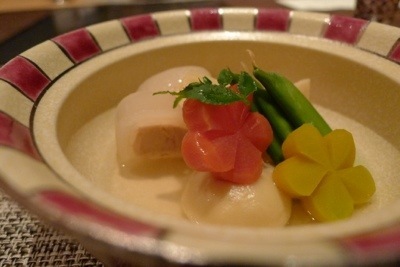 Little did I know that Chef Shinichiro Takagi is well-known for his innovative approach to Japanese cooking. Zeniya’s founder was his father who started the restaurant in 1970. We were thrilled to find out that Chef T spoke English and kept us entertained and informed throughout dinner about the local culture and places to visit. 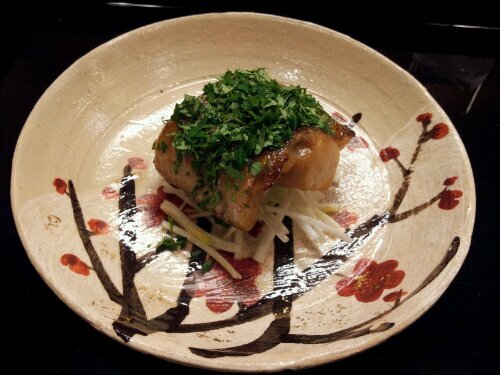 He also told us that he has another restaurant in Kanazawa in the Geisha district and another overseas branch in Seoul. He also divulged that his father and him were invited to open a fine dining establishment in Sydney in the 80’s, but the deal did not go through. With training from the famous Kyoto Kitcho restaurant and having studied abroad including a stint in New York, it’s no wonder then, Chef T regularly guest chef overseas. On the night of our dinner, he and his team of chefs had just returned from a week long of cooking for a private function in Saudi Arabia. The unassuming restaurant is actually a 2-storey building with large private dining spaces, popular with the local politicians, media personalities including overseas star chefs Tetsuya and Alain Duccase! To be close to action, we chose to sit at the eight-seater counter. 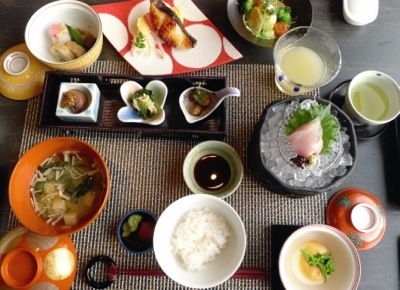 The food at Zeniya is a celebration of the culinary culture of Kanazawa, where local produce is artfully presented and also healthfully with a twist. 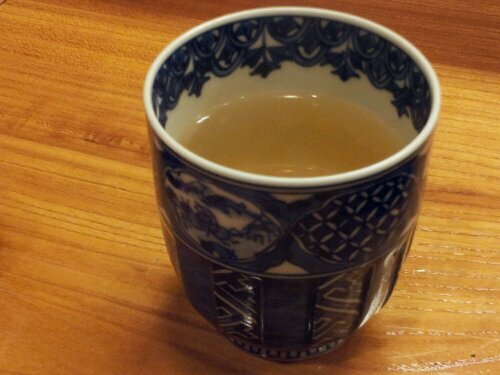 YACHIYA SAKE from the most famous and oldest sake brewery in Kanazawa. It is a family business started in 1628 and currently in its 16th generation. 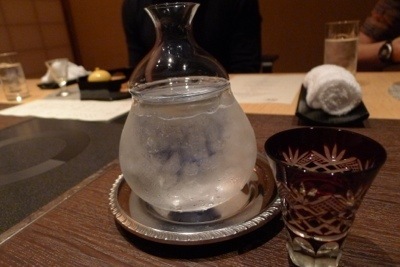 True to Japanese family-run restaurant tradition, his wife came out to pour a round of sake for us. 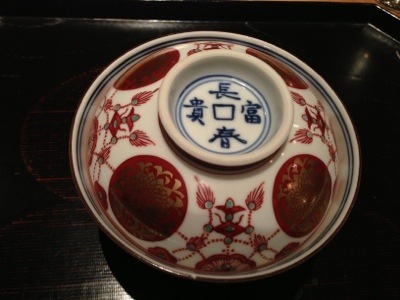 There has been comments that kaiseki was developed in Kanazawa as a means to show off the fine lacquerware. The lacquer ware and crockery that the food were presented at Zeniya were from Chef T’s father’s collection from over 40 years ago. They are still in pristine condition. 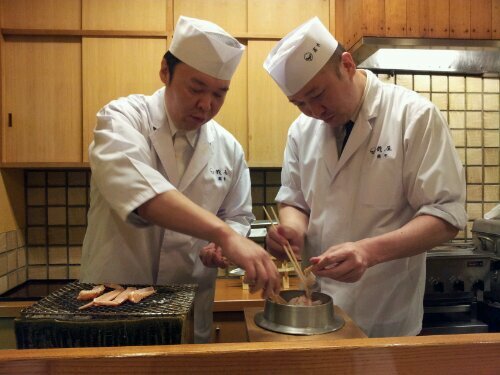 Chef T also mentioned that a must-visit in Kanazawa is the gold leaf factory where he had accompanied Alain Duccase to buy 200 sets of gold-leaved chopsticks! 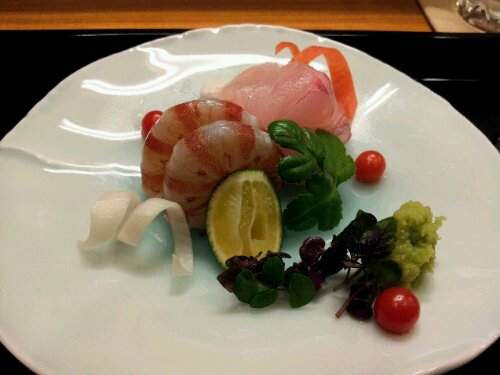 Sashimi, prawns in yuzu accompanied by local tomatoes. The star of the plate is definitely the baby tomatoes. Have you ever seen such small cherry tomatoes? 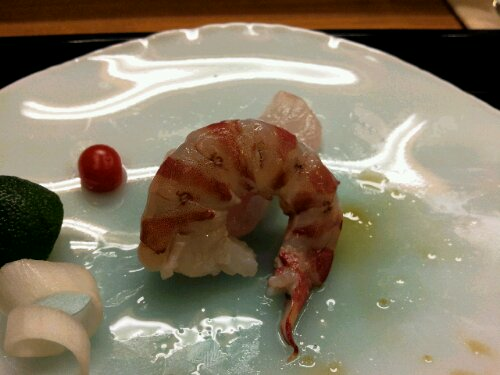 Red distinctive rings on the the prawns marking freshness and ‘seasoned’ by the squeeze of yuzu juice. Chef T’s explained that this is his twist on carpaccio. 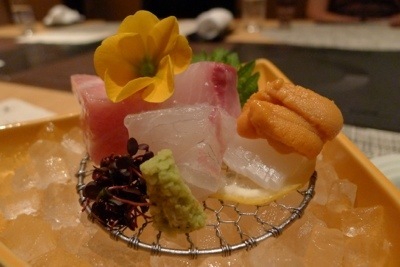 Bonito shavings on marinated sashimi decorated with edible flowers. It certainly has a ‘twist’, very tasty and ‘Italian’ with additional flavouring, departuring from the traditional sashimi of soy sauce and wasabi. The piece of fish practically melts on my tongue. 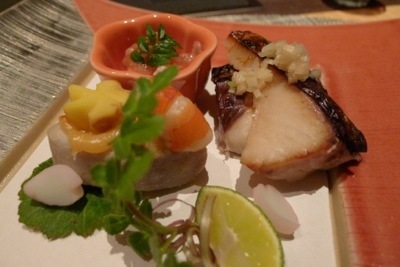 The prepping of the locally sourced Manjugai clam was a bit violent! 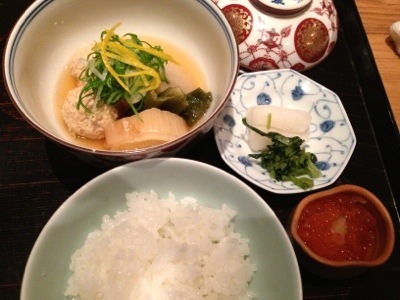 The clam was given a few slaps on table to toughen it, because otherswise it would be too soft. Then sliced and presented on a bowl of ice. 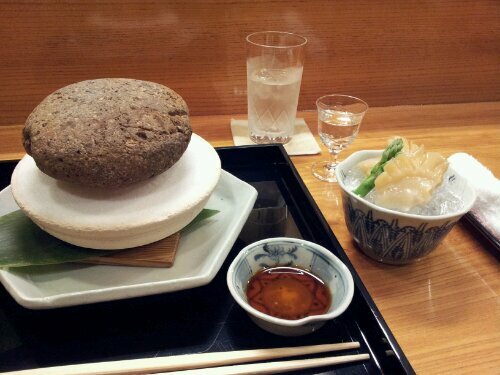 The rock was handpicked from the river, less than 10% made it to the table since it need to sustain very high temperature. 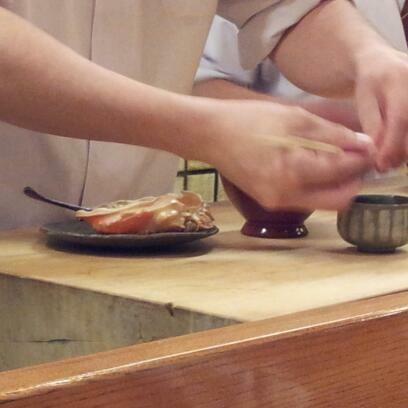 This is a DIY where we cook the clam on a hot stone, then dip the clam into the soy sauce under the watchful eye of the chefs. This is an exquisite platter of appetisers. Each piece is meticulously prepared. 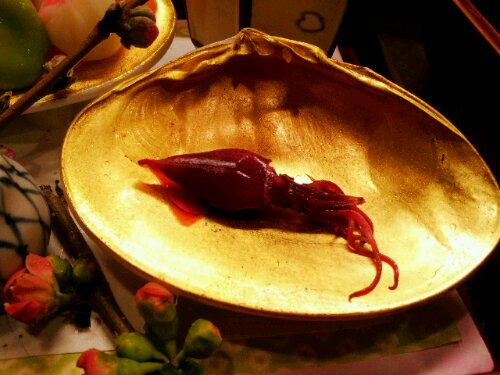 The star here is the Firefly Squid on a gold-plated plate that Kanazawa is so famous for. 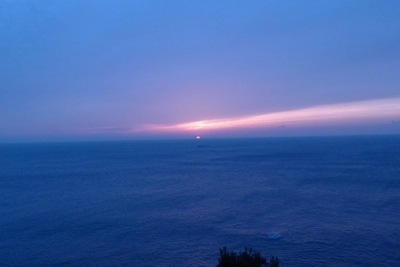 The squid signals the arrival of Spring and is special as it emits blue light. Milky and tender – what more can I say? 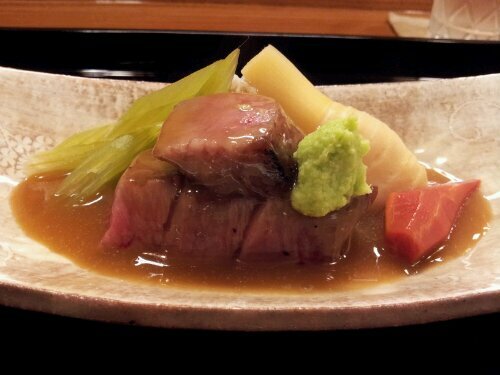 Kogashima Beef, one of the Top 3 beefs in Japan, served with freshly grated wasabi, turnip and leeks. The beef was not fatty, but meltingly tender. Lots of fiddly work to pick the meat out of the long spindly legs of the crabs, so co-operations of 2 chefs are needed. Chef T on the right with his second-in-command. 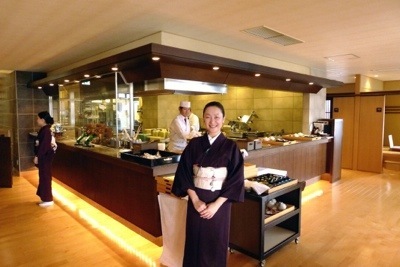 Dining at Zeniya is not cheap at ¥30,000 per person, but Chef Takagi – with his entertaining stories and sociable demeanour – completes the experience. Tapas are primarily small bites with something to drink. 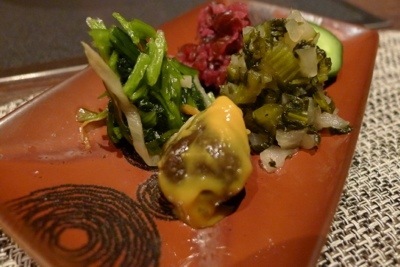 After some surfing on the net, I decided to go for an ‘adventurous’ molecular dinner at Tapas Molecular Bar at Mandarin Oriental Hotel, Tokyo. 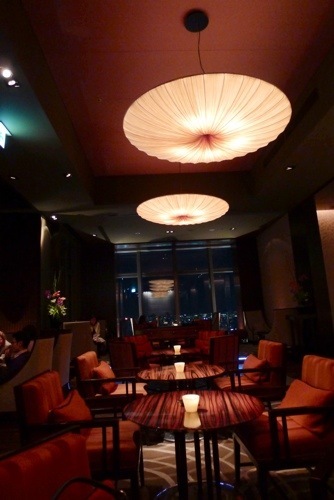 I will advise to book sometime ahead since there are only 2 seatings per night accommodating 7 diners per seating. True to its name, this tapas bar is REALLY a bar – a cosy 7-seaters tucked away from the Oriental Lounge where we can watch the bartender mix cocktails at one corner while waiting for our dinner to start. 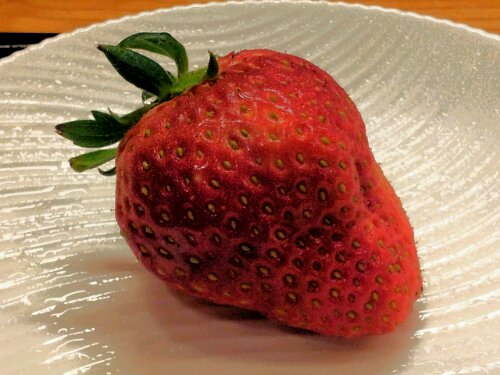 From reading blogs and reviews, I came to understand that the main draw card is the highly entertaining Canadian chef called Chef Ramsey. 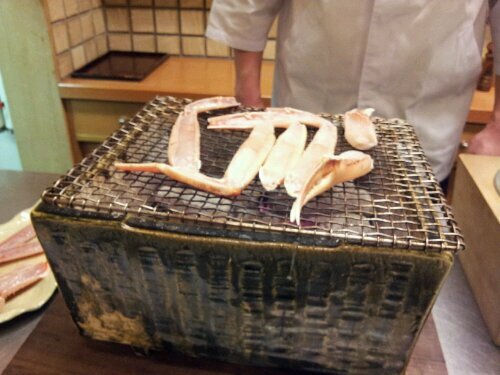 Unfortunately, it was his off-night, so we had his second-in-command, Chef Yamamoto to ‘perform’ for us.